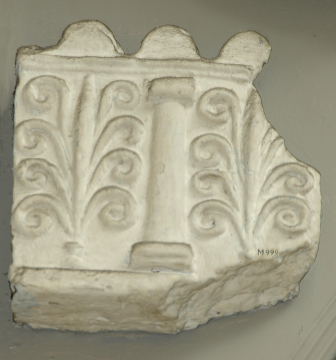 This fragment is a section of a Sima slab (?) consisting of alternating columns (only one remains) and palmettes springing from vases, between continuous fillets and all below a serrated top moulding. 1 H. Von Rohden and H. Winnefeld, Die antiken Terracotten, p. 242, pl. III, no. 1.